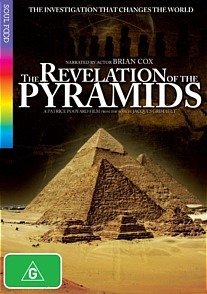 Revelations of the Pyramids DVD Review If you are into Egyptology and want to know more about the mysteries of that world, then this is a doco that would be well worth your while checking out. I thoroughly enjoyed it and learned a lot along the way as well. This awesome documentary shows a six year journey of discovery that delves deeper into the science behind the pyramids, and comes up with a number of theories supported by other scientists that really will change the way that people look at the history of these lasting icons of ancient civlisations. Whilst some of the interviews carried out by documentary maker Patrice Pooyard do contain high brow concepts, all are easily understandable to the lay person. What Pooyard believes that he has uncovered is a message for all of us that was first uttered long ago carrying relevance for us today. Travelling to locales that are both exotic and beautiful, Revelations is a stunning glimpse at a world that whilst known to us all, at the same time contains so many secrets, many of which are presented in this documentary. Patrice is a believer in what is being presented and whilst what is being shown could be thought of sensational, it is also well thought out and compelling. If you are into Egyptology and want to know more about the mysteries of that world, then this is a doco that would be well worth your while checking out. I thoroughly enjoyed it and learned a lot along the way as well.